When you are trying to gain muscle, and even when you are trying to lose weight, eating foods with a high amount of protein is very good. Protein is the building block of muscle, and the more muscle a person has the easier it is to burn fat. When you are searching for the best sources of protein, it's always better to choose real food rather than supplements. When you have real protein, you are able to get other nutrients that the other sources don't provide. Most people think of meat when they think of protein, and there is a good reason for this. 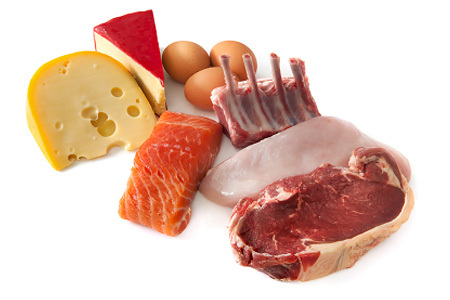 Meat from various animals is the simplest way to get the protein that you need to put on muscle. However, meat is not the only way to find protein. The following list of high protein foods will get you started on your track to adding lean muscle. A chicken breast that is around 3.5 ounces will contain about 30 grams of protein. Lean chicken breast is one of the best foods that you will be able to find when you are seeking out high protein options. It is also a very versatile food and you can create many dishes with it. Chicken is a staple of body builders. Steak and burgers have high amounts of protein in them. A 16-ounce steak can have 35 grams of protein or more, and a ¼-pound patty of ground beef can have between 28 and 30 grams of protein. When you are choosing your proteins, you have to be careful. Red meat, for example includes cholesterol and fat, which aren't good for your health. You should make sure that you always buy lean cuts of meat. Tuna is a healthy food with around 40 grams of protein in a 6 ounce can. It is a wonderful source of protein as well as Omega-3 fatty acids. However, you don't want to overdo the fish because it can also contain high levels of mercury. It's a good idea to supplement your fish intake with other forms of protein. A single egg will have about 6 grams of protein and a cup of milk will have 8 grams. Cottage cheese is a healthy way to eat protein as well, and it offers around 30 grams in a cup. Different types of cheeses will have protein as well. Something that you have to consider when you are buying and eating eggs and dairy products is the amount of fat content in them. Try to buy low fat versions when possible. When you don't eat meat, it might seem like your protein choices are limited. However, some great options are available for vegetarians. Tofu, soymilk, split peas and beans all have high levels of protein. You will also be able to get protein from nuts and seeds such as almonds and flax seed. Protein is important in the diet, but make sure that you have plenty of carbohydrates and healthy fats as well. You want to have a balanced diet.